What’s it like to visit the archives? When you’re looking for information, you might try the internet first and then maybe the library. But you’ll find information in the archives that isn’t available in either. Here you get to engage with material created and handled by people in the past: this is the raw material that researchers use to reconstruct history, find evidence, or write books. But while most people have been to their local public library, fewer have been to the archives. You might be wondering what to expect. In this post, we’ll let you know. Is visiting the archives like visiting the library? However, libraries and archives collect different things and organize them in different ways. This variation will mean a different experience for you. Public libraries . . .
What does this mean for you as a visitor? Here are some things to know. The collections and the public space are kept separate. When you first come into the archives, you’ll find yourself in the Reading Room. This is where you’ll interact with the archival materials you’re researching. There are tools available to help you with your research like large tables, microfilm readers, magnifying glasses, lamps, and plenty of plugs for your devices. 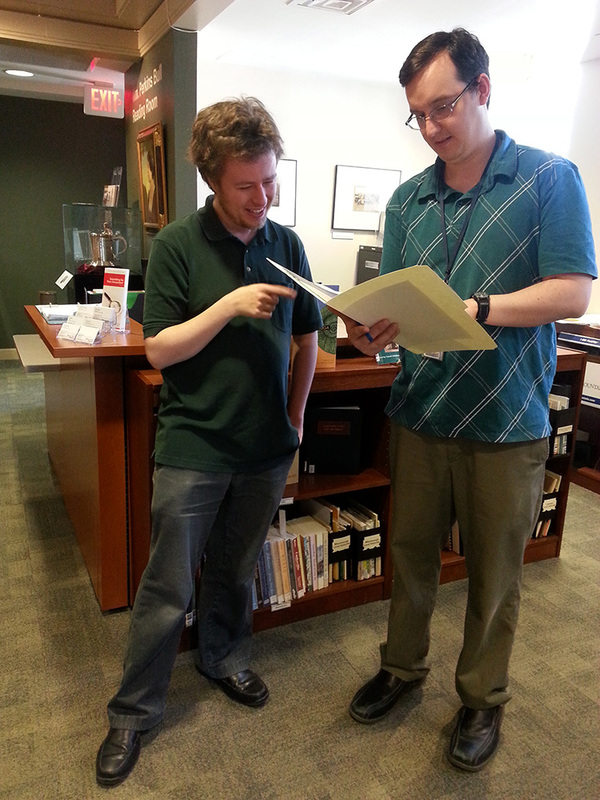 There are also reference materials like books and “finding aids” (special listings of the archival collections). But it’s important to realize that the Reading Room and its resources are only one part of the archives. The archival records themselves are in kept in our secure storage area in climate controlled conditions so they will last for many years. Only staff have access to this area to ensure the security and longevity of these rare materials. 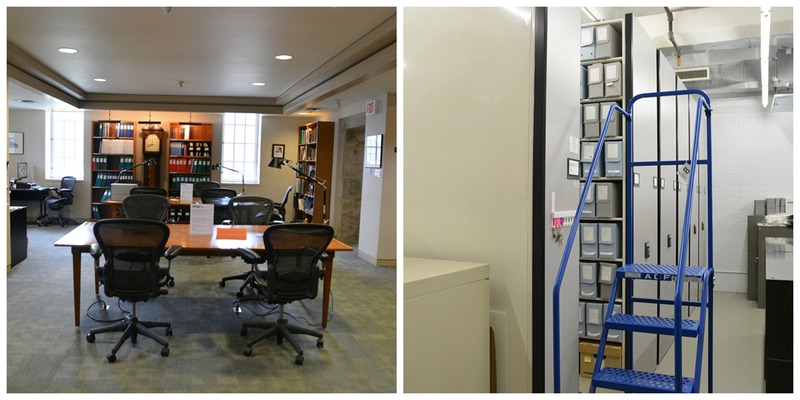 Part of the William Perkins Bull Reading Room at PAMA (left); PAMA’s secure archives storage area with movable shelving and controlled temperature and humidity (right). We’ll ask you to register and sign in. Just like in the library, you’ll need to fill out a form in order to obtain a reader’s card. It’s important for us to know who is using the archives (and when) as we make service decisions. Your personal information is safe with us; archivists are specially trained in how to protect it. Unlike the library, we’ll also ask you to sign in and sign out every time you visit. This helps to give us a snapshot of activity in the archives in the rare case that materials should be misplaced. We’ll talk with you about your needs and bring you potentially useful records to review. Most public libraries let you browse the shelves yourself to locate books you want to use. However, because archival materials are so rare, we need to keep track of them at all times. This means that we’ll be bringing the records to you in the Reading Room. As you’ll see, most records are stored in special acid-free boxes and file folders. Although you can’t browse the shelves of archival material, you’re always welcome to browse the reference material in the Reading Room which can help to give you an idea of what we have. And we’re always here to offer advice. Because archival records are organized uniquely, archivists will often know about interconnections and cross-references that you might otherwise never know about. It’s a good idea to contact us to plan your visit. This helps us to carefully consider your needs and retrieve records for you ahead of time. We’ll let you know how to handle the archival material. Many of our records are fragile and all of them are rare. We’ll ask you not to eat or drink in the Reading Room and also to use pencils rather than pens (let’s avoid those permanent stains!). There might be other measures we’ll ask you to take, depending on the records you’re using. These could include wearing cotton gloves or using a book cradle. 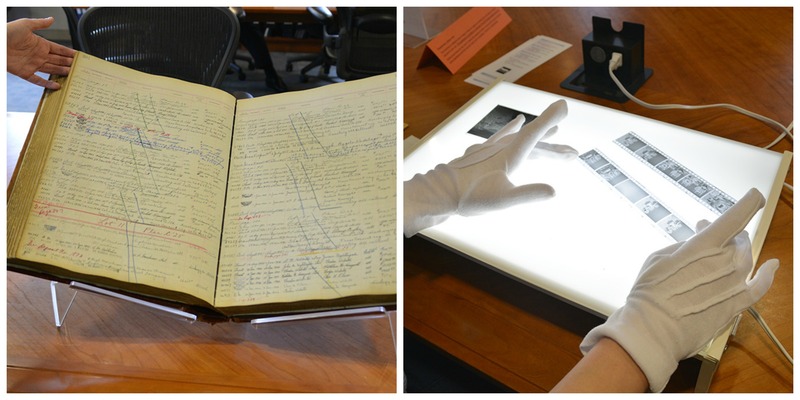 Supporting a book to protect its spine (left); using cotton gloves when handling negatives (right). In some cases, records also have special restrictions on them because of privacy laws or donor requests. This may mean we’ll need to review the records before you see them and discuss conditions of access with you. Taking a copy for yourself might require a little care. In a public library you can photocopy things yourself; in the archives we’ll do the copying for you to help preserve the material. Some material will be too fragile or awkward to copy safely. In many cases you can take your own photographs of material as a research aid. Just let us know what you need to copy and we can review the options with you. Besides a camera, you also might like to bring a USB flash drive to save digital shots of microfilmed resources. 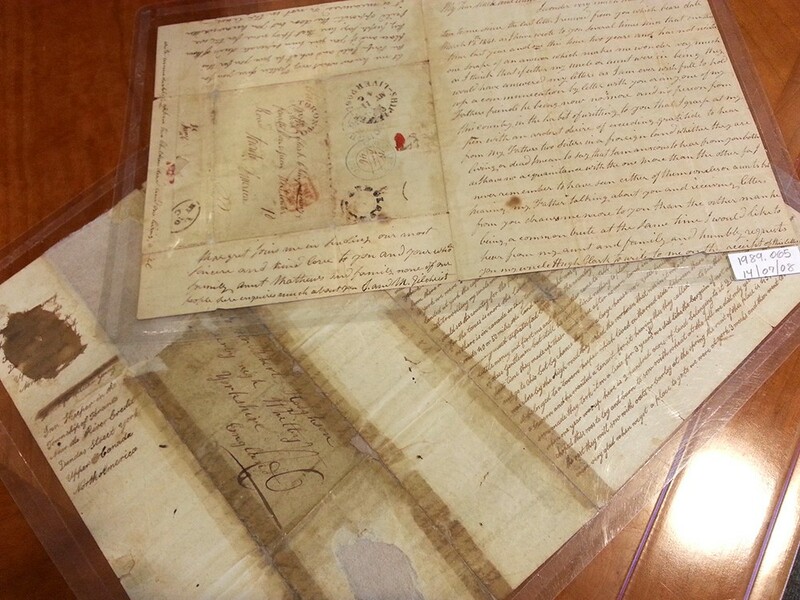 Some important but fragile letters encapsulated – not laminated! – in Mylar. Be prepared to savour the experience. It’s tempting to want information fast and at our fingertips these days. However, many people find that the slower pace of archival research is absorbing. There’s nothing quite like meeting someone from the past in the traces they’ve left behind. You may find you come to enjoy the thrill of the hunt – and of discovery! 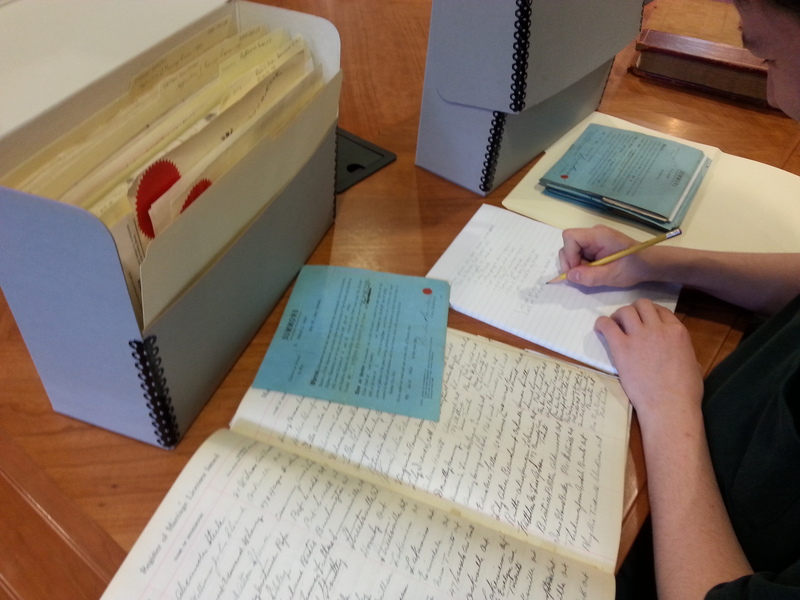 This is the first post in our “Archival FAQs and Facts” category where we address questions we’re often asked and reveal fascinating facts about the archival world. Thanks for your encouraging comment! Even in the internet age we can all learn to love “slow research.” It’s not only necessary, it’s also humanizing and enjoyable.